No need to regulate homosexuality in Russia, Medvedev says | Russian Legal Information Agency (RAPSI). MOSCOW, December 7 - RAPSI. 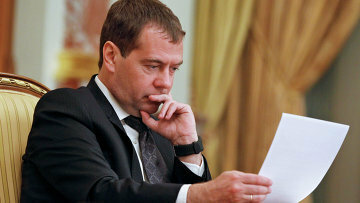 Prime Minister Dmitry Medvedev said at a press conference Friday that he sees no reason to limit homosexuality by law. "Not every moral issue, behavioral habit or communication issue between people should be regulated. This is why not all relationships between people are subject to a legal interpretation," Medvedev said in response to a question on banning homosexuality. The prime minister said that there was too much fuss about the issue and that in Russia the issue concerns few people. "Probably this issue does not concern too many people in the country, and it's not discussed at all levels," Medvedev said. At the same time he admitted that State Duma lawmakers have the right to submit any proposals or bills to the parliament. Medvedev's statements come at the end of a year that has seen its share of controversy with regard to laws involving homosexuality in Russia. A law imposing fines for "gay propaganda" took effect in St. Petersburg on March 30. It has faced heavy criticism from the LGBT community and rights activists in Russia and abroad, but it has also been proposed that it should be made into a federal law. Any citizen who breaks the law in St. Petersburg may be subject to pay a fine for an administrative violation. Claiming that Madonna violated the law during her St. Petersburg concert over the summer, nine plaintiffs sought upwards of $10 million in compensation for "moral damages." During the concert, the star handed out pink bracelets to the crowd in a show of solidarity with the city's gay and lesbian community. But the Russian court ruled US pop star Madonna did not break law on the promotion of a homosexual lifestyle among minors during her concert in St. Petersburg earlier this year. Russia's lower house may begin talks of a bill stipulating fines of up to 500,000 rubles ($16,220) for promoting homosexuality among minors on December 19. 16:32 07/12/2012 Prime Minister Dmitry Medvedev said at a press conference Friday that he sees no reason to limit homosexuality by law. "Not every moral issue, behavioral habit or communication issue between people should be regulated.